Guys, Guys, GUYS!!!!! 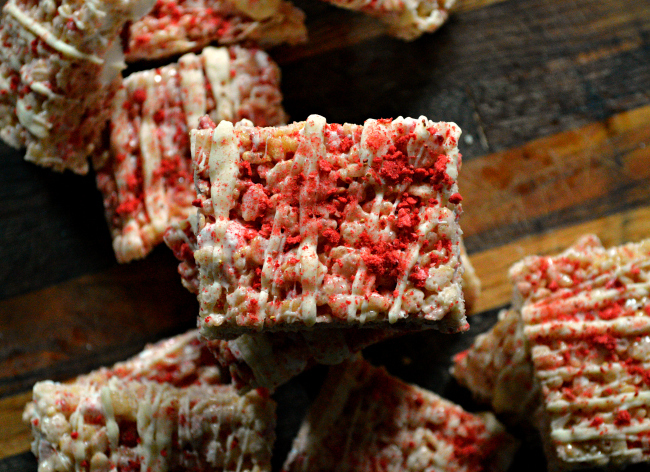 Stop what you're doing and make these! I know, I know, everyone makes krispy treats, but these are different! Have you ever used freeze dried fruit in anything? The beauty of them are, they don't get super sweet like regular dehydrated fruit, they stay perfectly tart. Mix them with the super sweetness of the marshmallows and you have a match made in heaven! I really love freeze dried fruit. You can crush them into powder and it is so concentrated that you can stir it into any thing for a major kick of flavor. Stir it into a yummy buttercream and you have the best strawberry frosting you'll ever try. Add it to a basic cake batter and it makes a huge difference to your strawberry cake! I've made these a few times and no one can keep their hands out of them. I actually just finished one while I'm sitting here at my "Ladies ONLY" Craft Retreat. I made a double batch and 24 hours in, they're almost gone. My kids and husband devour them every time. My sister and niece do the same. I bake so many things and create so many desserts, so for one this simple to be such a favorite, you know it's a winner. I'm currently working on some fun versions of these guy. Line a 9x9 with parchment paper. Rip off an extra piece, about the size of the bottom of the pan and set aside. In a large pot, over medium heat, stir butter and marshmallows until melted. Remove from heat, stir in rice cereal. Once mostly combine add in remaining 2 cups marshmallows and 1/2 cup crushed strawberries. Pour into pan and using the extra sheet of parchment press into pan until flat. Allow to cool and set, about 30 minutes to an hour. Cut into squares and place on a cooling wrack with parchment under it. In a small microwave safe bowl melt white chocolate at 10 second intervals, stirring in between until melted. It should not take more than 30 seconds. 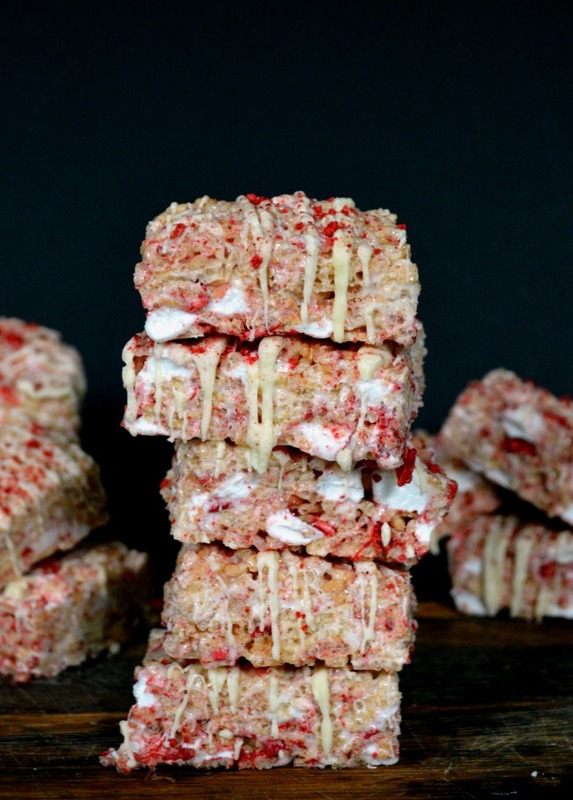 Drizzle white chocolate over squares and sprinkle remaining crushed strawberries on. *If you skipped the white chocolate just sprinkle the berries on the top after you pressed the treats into the pan while cooling. Visit Ashley Baker's profile on Pinterest.